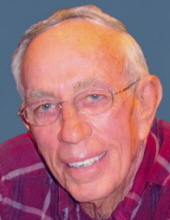 SUMMITVILLE, IN- Morris E. Brown, 80, passed away on April 1, 2019 at Marion General Hospital in Marion following an extended illness. Morris was born on November 24, 1938 in Elwood to Merle V. and Edith (Ebert) Brown has resided in the Summitville area all of his lifetime. Morris graduated from Summitville High School-Class of 1956. He farmed all of his lifetime and his greatest joy was planting the seed and watching the crops grow and mature year after year. He was a member of the Summitville First Christian Church, but attended the Summitville First Baptist Church. Morris was especially proud of being married to the love of his life Phyllis Stitt for 58 years. Services honoring Morris’s life will take place at 1 pm on Friday, April 5, 2019 in the Summitville First Baptist Church, 700 East Mill Street, Summitville. Interment will follow in Vinson Memorial Park Cemetery. Friends may call at the Summitville Baptist Church on Thursday, April 4, 2019 from 3 pm to 7 pm or after 12 Noon on Friday prior to the services. Memorial contributions are suggested to the Summitville First Baptist Church with envelopes available at the visitation and services. To send flowers or a remembrance gift to the family of Morris E. Brown, please visit our Tribute Store. "Email Address" would like to share the life celebration of Morris E. Brown. Click on the "link" to go to share a favorite memory or leave a condolence message for the family.